CUTE, COOL AND UNDER CONTROL! Delicious bite-sized tasty treat with a flavour combination that your dog will love. 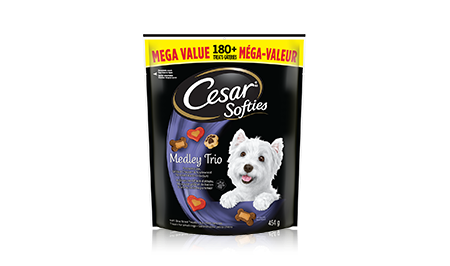 Each package of CESAR® SOFTIES dog treats are soft and smooth in texture and are just 7 calories each. For those special moments when they just melt your heart, reward them with a CESAR SOFTIES™ treat. With an irresistibly soft texture and mouth-watering. Feed 2 treats per 2.3 kg (5 lb) dog daily. Please ensure your dog is always provided with clean fresh water. ®, TM and the WHITE WESTIE are trademarks of Mars, Incorporated and / or its affiliates. © Mars, Incorporated, 2018. All rights reserved.